The following photographs were taken at LoneStarCon 2, the 55th World Science Fiction Convention, in San Antonio, Texas. 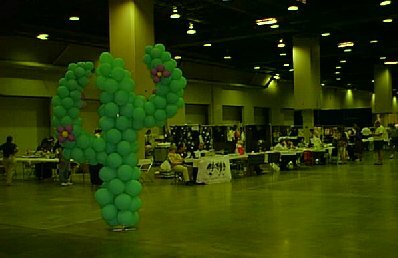 Giant balloon cacti guarded the entrace to the dealers' hall. 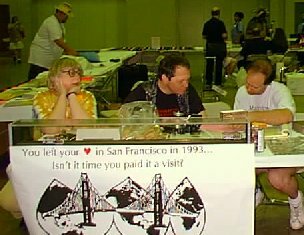 Mary Kay Kare, Dave Clark and Greg Docherty staff the SF2002 bid table. 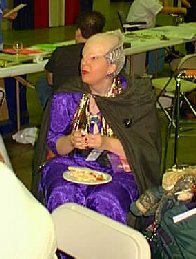 Even Mimbari ambassadors have to eat - Shirl Roth as Delenn. 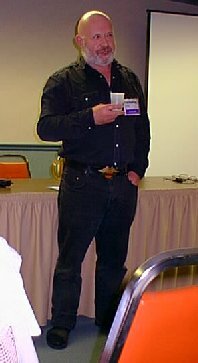 Lionel Fanthorpe holds forth on the mysteries of Badger Books.